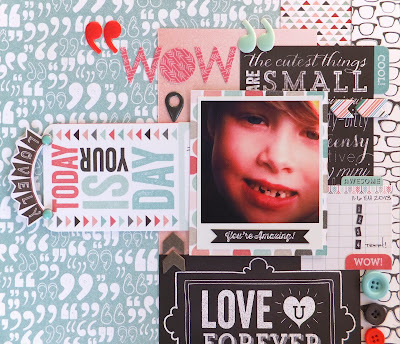 Sarinda here with a layout using My Mind's Eye Cut and Paste I want it all bundle from www.FotoBella.com. I have been raving about this collection in the my last few posts that have been more or less Valentine's Day based. Here I wanted to show you yet again how versatile this collection is. The black accents in this line works for wonderful for boys. Of course I am always looking for collections I can use for my Son. By adding a bit more of the black embellishments makes this more masculine. Note the pull out under the photo. I have added my journaling to the back of this. 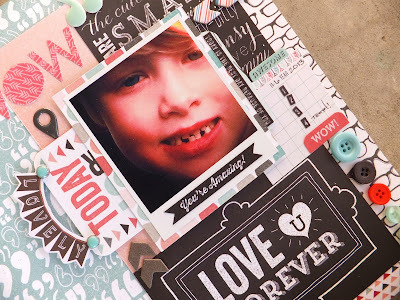 I love how you used this bundle for a boy's page!! It looks great!! Agree with Apryl! Loving all the details. I love how you used these three papers together, it looks amazing, I wouldn't have ever been that creative.